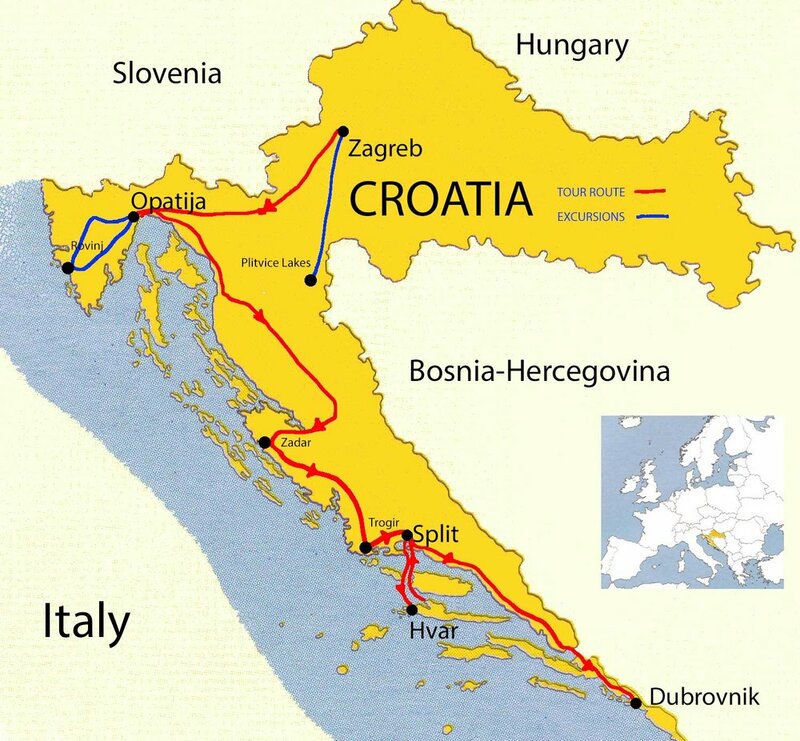 A relaxing journey from Zagreb to Dubrovnik, touring along the magnificent Croatian Coast. Croatia is geographically situated on the crossroads between central Europe and the Mediterranean. The tour begins in beautiful Zagreb, and covers the entire Dalmatian Coast to magical Dubrovnik. The locations have been carefully selected to provide an interesting combination of destinations and experiences. Charles places emphasis on slowing down and allowing maximum time to enjoy the locations, food and culture. This is enhanced by having a maximum limit of 12 participants, ensuring a relaxed, informal atmosphere. You can get a feel for the tour by watching this short video made of the 2018 tour. Many people think that because Charles is an Artist that this is a tour for artists, but the truth is, this is a tour for anyone and everyone - no artistic skills required. It is not an art or painting tour - it is a relaxing holiday! If you enjoy travelling at a relaxed pace, staying in beautiful hotels in magnificent locations, dining in cafes and restaurants and having plenty of free time to do as you please, then this is a tour for you. A perfect combination of organised activities and free time. It is to be considered as a holiday with some painting and sketching thrown in, for those (if any) wishing to paint. Charles is tour leader and although he will be doing some painting and sketching on occasion, it needs to be made clear that this is not a workshop type of tour. You are having a holiday and painting a little if you wish. You will be painting with Charles, but he will not necessarily be giving lessons, although he is happy to give advice if you seek it. He is happy for you to watch him paint or sketch. He suggests you approach the tour as a chance to do some sketching and/or painting in some amazing locations that he will show you, and treat your work as a visual journal of a great holiday. How much painting/sketching you do on this tour is your choice. It is important to Charles that you feel relaxed and free to paint as little or as much as you like, or not at all. Although born in Australia, Croatia is the land of Charles’ ancestry. He speaks the language (certainly well enough to get by!) and is looking forward to introducing this magical destination to participants. Charles’ relaxed attitude and love of the country contributes to a most enjoyable time. Charles has been a Professional Artist for over 30 years and is a keen traveller. He has travelled to Europe and the United States and has painted in many locations around the world. He is an experienced and popular watercolour tutor, and has conducted twenty one tours to Europe. This will be his eigteenth tour to Croatia. We do not offer a an exhaustive list of tours to Croatia and/or other countries. We simply offer one tour to Croatia once a year and we give all our love and effort into doing it well. Some have described this tour as " a tour for those who don't like tours". If you wish to avoid the huge, impersonal tour package holidays and would like to experience Croatia at a leisurely pace with a small group, then join our fully escorted exclusive tour. We do our best to make sure that the holiday is as enjoyable as possible and that you return with memories of a beautiful destination and wonderful experiences. Days will be filled with sightseeing, excursions, relaxing, photofgraphing/painting/sketching, or the chance to shop. Painters, Photographers and other visual artists will find a wealth of inspiring subject matter at our destinations. The location of our hotels and the number of free days enable you to explore cultural and sightseeing interests. For those who simply want to enjoy relaxing by the Mediterranean, this tour will definitely satisfy. If good food, ancient towns, wonderful hotels, sunshine and the sea appeal to you, then so will this tour. Painters and photographers will have ample opportunity to create those masterpieces. Participants have always commented on the wonderful balance of sightseeing, relaxing, painting and free time on the tour. Don't listen to me when I say how wonderful my Slow Travel Croatia tour is :) Watch the video and listen to people that have been on the trip. We enjoyed the relaxed pace and great accommodation. We particularly liked the fact that the last day was free in each place, to pursue our other interests. Geert and I had a marvellous time on your trip, loving every minute of it. Everything you organized was well thought out and a good balance occurred between set activities and free time. A wonderful trip for painters and non-painters alike. The trip to Croatia with Charles was a dream for me as his organisation was flawless, giving me freedom to see and enjoy the sights, the great food and the friendly people of such a wonderful country. Sights, history, culture, new friends and lots of laughs (not to mention the food, beer and wine!) This is how a holiday should be. Despite the relatively short 3 week sojourn, I came away feeling as though I had become part-Croatian. Tour was very well organised and a credit to team leader Charles and his colleagues at Albury Travel. I would recommend this trip to anyone who wants to experience the real Croatia. Hvala lijepa. What more can I say but simply amazing ... from the accommodation, food, wine (that you don’t get a hangover from) painting locations and the laughter …one more time, amazing and very memorable … best organised tour I have ever been on. Peter and I had the trip of a lifetime. Charles was such a good organiser from painting, degustation dinners, tour guide and incredible patience. We had so much fun, never stopped laughing. Many thanks Charles for an incredible tour. My experience is one that I shall never forget … I learned about Croatia, its lifestyle, language, food, wine … oh yes and painting! Your knowledge of Croatia and willingness to share it with us made this more than just a "tour". Charles, thank you for a fantastic trip. This was my best ever painting 'holiday' - I loved the country of Croatia and enjoyed seeing the various aspects of it, the Plitvice waterfalls; the 'Tuscan' villages of Istria, and the magnificent Dalmatian coastline and islands. Being a small like-minded group we relished the Croatian cuisine, had a lot of fun . Thank you Charles. Croatia is a peaceful, young democratic country (member of the UN and EU), which may surprise people considering the well-publicised strife that followed its declaration of independence from Yugoslavia in 1991. Most of the country remained untouched by the conflict and today it is among the safest countries in the world to visit. Croatia’s size compares to all of Ireland, with a population of over 4.5 million. Zagreb is its capital and more than half of Croatia borders the Adriatic Sea. Croatia has a spectacular coastline of 1,778 km and 1,185 offshore islands. The country has evolved from centuries of occupation from foreign empires – namely the Romans, Venetians, Austro-Hungarians, Greeks, and French. This has produced a culture fascinating in its diversity. It has a charm that is neither Mediterranean nor Central European, but a unique combination of the two. Find our more about Croatia here. Zagreb is one of the oldest cities in Europe and can offer its visitors the Baroque atmosphere of the Upper Town, picturesque open-air markets, diverse shopping facilities, an abundant selection of crafts and a choice vernacular cuisine. Zagreb is a city of green parks and walks, with many places to visit in the beautiful surroundings. In spite of the rapid development of the economy and transportation, it has retained its charm, and a relaxed feeling that makes it a genuinely human city. Opatija (pronounced o-putt-eeya) was the fashionable seaside resort of the Austro-Hungarian Empire. The grand residences of the late 19th Century, painted in fresh pastels, add to the elegance and charm of this town. The stunning coastline, clear waters and many parks containing tropical plants, makes Opatija a favourite destination for a holiday. The delightful 12 km coastal promenade is lined with bay trees, palms, figs and oaks, and 19th Century grand villas. Split is a seaport that emerged from a Roman settlement founded between the 3rd and 4th Century BC. The Roman emperor Diocletian built a palace in Split in the 4th century, which is the heart of the old town. It is one of the most imposing Roman ruins in existence and is home to 3,000 people as well as shops, cafes and restaurants. UNESCO designates Split as a cultural treasure. Its palm lined ocean front promenade is reminiscent of the French Riviera, but the rest of the city reveals a striking combination of Roman, Venetian and Hapsburg influences. This is an island of vineyards, olive groves, lavender and exuberant subtropical vegetation. It is an island paradise with more hours of sunshine than anywhere on the Adriatic. Our town (also called Hvar) is a medieval town that lies between protective pine-covered slopes and the azure Adriatic. The Greeks, Romans, Venetians, Austrians and French have all occupied this area and have left their influences. A combination of Renaissance and Gothic palaces are hidden among narrow backstreets below the 13th Century city wall, and a long seaside promenade winds along the indented coastline. In this traffic free town with a maze of streets we have a chance to truly unwind, relax and explore our island paradise. Dubrovnik for some will be a highlight of the tour and understandably so. Dubrovnik is known as the Crown Jewel of the Mediterranean and is a walled city of beautiful architecture, set on a peninsula jutting into the Adriatic. It is simply one of the prettiest places in the world. The old town with its marble streets is almost completely untouched by the modern world. It has a profusion of fine sculpture and architectural detail that underscores a common artistic heritage. Words cannot do justice to this dazzling place, which has left many a visitor spell bound, enchanted, and wanting to return. Our hotels are all positioned so that you have easy access to museums, galleries, shops and other attractions. The hotels vary from 3 to 5 star rating. All rooms have private facilities and hotels have lifts (with the exception of Split and Hvar). Our five star hotel is the most beautiful in Zagreb. It was built in 1925, has a stunning art deco lobby and was originally a stop on the ‘Orient Express’. It also has one of the finest restaurants in the city. It is a luxury hotel, with the Botanical Gardens nearby and within a beautiful short stroll of the city centre. Our (small) three star hotel in Split could not be in a better position. 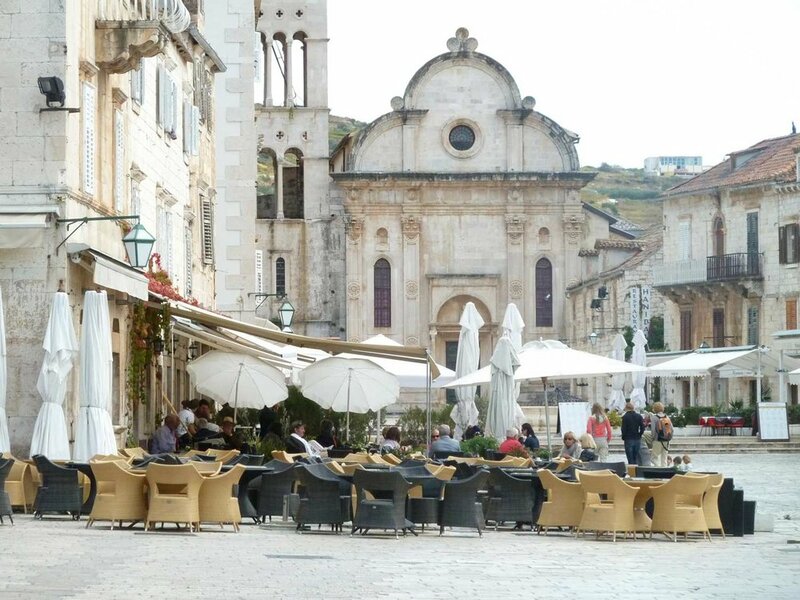 It is within the walls of the Diocletian palace and is the most central of all hotels. Some of the rooms have been designed to show the stonework of the original 4th century palace wall. It has a restaurant named Tiffany, where we have our breakfast – so you will have 'Breakfast at Tiffany’s'! This four star hotel was a former baroque style palace and is one of the earliest baroque buildings in Hvar town. The position of this hotel offers stunning views of the waterfront. The apartments are one bedroom with a double bed and a lounge with sofa bed. Our hotel is the most luxurious hotel in the Babin Kuk complex and has 5-Star classification. It is a resort style hotel of 7 floors with 163 rooms, all of which have a balcony with a direct view of the Elafiti Islands. This hotel is the perfect place to watch the sunset while sipping a drink. There is a regular local bus to the old city every 10-15 minutes, leaving from the front of the hotel. Gourmets will not be disappointed in Croatia. Croatian cuisine is as varied and rich as its culture. You will be tantalised by the cuisines of the separate gastronomic worlds of the many islands and towns. Meals will vary from picnic lunches, light meals at pizzerias, to exquisite meals at some of the best restaurants along the Adriatic coast. Being situated along the coast, seafood is a specialty, but many other foods are also highly recommended and available. In fact the freshness and quality of the seafood is one of the major reasons (as well as the magnificent coast) why so many Italians make this area their choice of holiday destination. Burek - a pastry stuffed with meat or cheese. A delicious meal for those on the run. Lamb cooked under a peka – lamb slowly cooked under a ceramic or metal bell that is covered in coals- succulent and delicious! Istrian tartufe - pasta with fresh wild truffles from the forests of Istria - a real delicacy. Palacinka - a thin crepe filled jam (or many other fillings) and topped with chocolate. We must not forget the wines. Wine is an important part of Croatian meals and each region produces its own wine. They all have strictly controlled geographic origins, and their production and bottling meets the highest standards, which is why many of them have become world famous. As our hotels are centrally located our own transport is only needed for transfers on certain legs of the journey. For transfers we have a 14-seater mini-van and for other journeys we will utilise taxis and public transport (buses and ferries). A number of exclusive guided tours are included to enhance your appreciation of some of the areas visited, including tours of Zagreb, Split, Hvar, and wonderful Dubrovnik. See detailed itinerary for further information. Side trips are planned to: the ‘Tuscan-like’ hill-top villages of Istria, Motovun and Hum; the beautiful seaside port of Rovinj; the Island of Lokrum, with its Benedictine Monastery and botanical gardens; and various towns on the island of Hvar (see detailed itinerary for more information). We also have a day trip to Plitvice lakes. Plitvice Lakes is the most visited National Park in Europe. It consists of sixteen turquoise lakes, linked by a series of waterfalls and cascades, surrounded by wooded hills. You can walk the wooden footbridges that follow the streams over, under and across rumbling water. UNESCO declared the lakes a World Heritage Site because of its extraordinary natural beauty. We walk through this wonderland at one of the best times of the year. The weather is pleasant and the arrival of the Autumn colours is evident in the surrounding forest. This is a highlight of the tour for many.